Mumbai can be an unfriendly city for the cyclist. There’s traffic, potholes and the monsoons don’t make it any easier. But I’ve found that cycling, if people know where to go, can still be a great way to spend the weekends. Here are some of my favourite spots in the city, ranging from the old-world charms of South Mumbai, to the flamingoes in Sewri, which are still seen best on a cycle. I like to head to the southern-most tip of the island city in the early hours of the morning to see some of our most prominent landmarks in their most serene moments. The sights include the heritage buildings round Fort, a stunningly beautiful waterfront promenade stretching till the National Centre for the Performing Arts (NCPA), and of course, the Iconic Gateway of India. This route is perfect for any cycling amateur, or even a beginner looking to explore the city. A ride from most of the city’s suburban parts to the NCPA would almost cover a stretch of 45-50 kilometres, and can take up to two hours of riding. Great local eateries abound in this area to appease my taste buds, so breakfast is a welcome ending. Head there early in the morning to avoid traffic. A classic breezy route for a cyclist, a ride to Palm Beach always make me feel good. The entire stretch of the palm beach is beautiful and paved with walkways, as well as a great view of the surrounding lake and greenery. This ride can easily be a 75km return journey from South Mumbai, or the western suburbs. Depending on my speed, it can take up to three hours. I suggest early morning to catch the light breeze of the sea. Heads up, be wary of speeding vehicles, and stick to your track. A speed-lover’s delight, this stretch includes the 10 lane Eastern Express Highway. Thane has the famous Yeoor Hill climb for those wanting to really sweat it out. On the way back, I like to stop at any of the South Indian eateries in Matunga for a well-deserved breakfast with filter coffee. I love this stretch as it allows me to ride smoothly and at my fastest speed. Often I’m greeted by cyclists who love to race each other on this stretch. A lovely spectacle, the Sewri-Mahul mudflats are a nature’s delight. The Sewri mudflats might not be in the best parts of Mumbai, but it boast of having thousands of flamingoes who migrate here in the winter. Early mornings see bird-lovers jostling to catch a glimpse of these beautiful birds, so I recommend start the trip as early as possible. For example, a ride from Bandra to Sewri mudflats is almost 11-12 kilometres, and can take up to 30-40 minutes depending on the traffic. #LBBTip:Check out the Sewri Fort while you’re there, which overlooks the Mumbai harbours. A great way to satisfy the urge to do really long rides while not leaving the city limits, I suggest the Mumbai City Century ride. To trick is to do a loop from Western Highway down to JVLR, and turn right towards the Easter Express Highway. Then ride till Thane, turn back, and ride all the way to NCPA and back to the starting point. It’ll easily cover 100 kms, and will take approximately up to 5 hours. 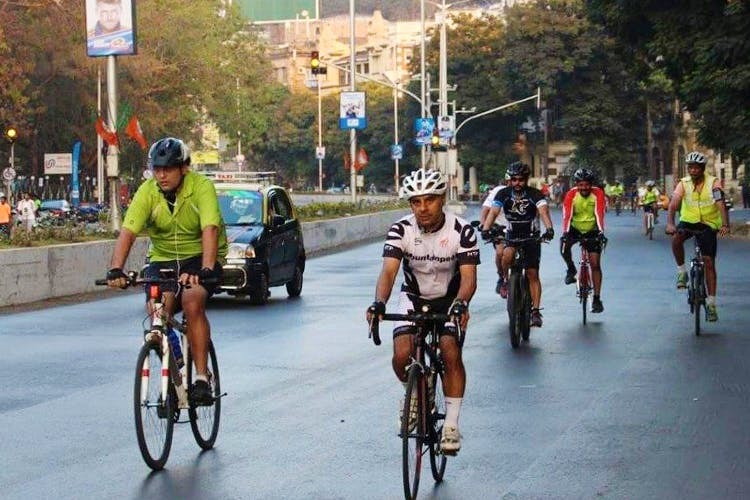 For more cycling events, and activities, follow Mumbai Cycling Enthusiasts here.